“Visit Birdhaven, my new Studio Sculpture Gallery, here in Woody Creek. How very many times I have laced my text, here on MC.com, with the above, now familiar, refrain. But as there appear to be a great many Woody Creeks, scattered here, there and everywhere, just where in the world is this particular Woody Creek located? Good question. Woody Creek, Colorado, is situated at an elevation of 7,300 feet, and occupies a particularly idyllic spot along the Roaring Fork Valley, 8 miles north of Aspen. The high elevation is due to an upward thrust of the continental plates. The same eastward-drifting tectonic plate, responsible for creating the San Andreas Fault, also pushed up the Rockies, in one fell geological swoop. Jostled along by our planet’s ever-shifting tectonic unrest, the Pacific plate was forced down, and under, California’s turbulent West Coast; only to pop up a thousand miles inland in the form of North America’s the iconic ‘Rocky Mountains’. “Vast deserts, snow-peaked mountains, rushing rivers… gigantic ravines“. There is something astonishingly ‘other worldly‘ about the Great American South West, and can often prove to be a taxing environment for humans; tough mountains, tough winters, blistering summers… not to mention rattlesnakes! (No rattlers here in the Roaring Fork Valley however, I’m relieved to say). But the stunning sights, the awe-inspiring landscape, along with a vast option of physical pursuits, combine to elevate the entire, mindbogglingly enormous, region into one HUGE outdoor adventure park. Stunning region it may be however, I do grant that the Great American South West is not unique in its assets, for our planet is festooned with magnificent scenery, breathtaking views, and astonishing sights. Its just that few places on Earth I think are able to boast quite so many grand old iconic geological wonders… in a similar a similar sized quadrant of land. Then there’s the whole subject of ‘ease of movement’. Many of the “black top two-lane highways” will strike you as practically empty – because, indeed for much of the time, they are! We all know just what a crowded world this has become, but to set out on a Wild West road trip is to leave all that behind. The larger cities that you visit, or pass through, will perhaps, from time to time, snare you with their congestion, but believe me, these busy sort of places are few and very far between. As for the actual roads themselves: Americans tend to complain about them being in bad shape, but I take the approach that they represent something of a modern marvel. Smooth, wide, predictable, and uninterrupted for miles upon miles on end, I doubt that you will enjoy a better mountain/desert driving experience anywhere. As for accommodation: we are talking about tens of thousands of spas, hotels, resorts, retreats… you name it… tucked away in remote canyons, on steep mountains, in cities and towns, both convenient and remote. After your full day’s worth of exploring you wont have to travel very far in order to rest, recuperate and relax, in fine style. Its and odd thought that if a line was stretched from Woody Creek to LA it would measure approximately one thousand miles, and would practically run the length of the Grand Canyon. This area, or quadrant; Woody Creek, Sante Fe, Los Angeles, Los Vegas and Salt Lake City – also serves to outline the perimeters of the zone in which I currently seek gallery representation. And so, during the coming weeks, months and years, I expect to find myself out and about this region myself, quite a bit. To date I have already found cause to explore vast swathes of the South West, but with such a huge stretch of land, massive great expanses of it still await my discovery. Gazing down from space upon this region, unencumbered by the clutter of mappery, I really think the incredibly wild nature of the American South West speaks for itself. Zion National Park, Rocky Mountain National Park, Dinosaur National Park, Death Valley, Monument Valley, Bryce Canyon and of course the Grandest of Grand Canyons… are but a few of the world famous geological features contained within this spectacular corner of the Earth. But, as mentioned above, don’t let the huge distances fool you: driving, out here in the West, is so speedy and uninterrupted that when a local is queried as to the distance to the next town, or any place, they will instinctively reply with the time in which the journey may be covered, with nary a mention of mileage whatsoever… and they usually seem to pretty much nail it within minutes. Whether embarking upon the South West American Way clockwise around The Grand Canyon, or in the counter direction, with a starting point set at Woody Creek, Colorado, you really are able to set your course through a dazzling array of landscapes; from cool high alpine woodland, to hot dry desert; steep rugged canyons, to pristine golf courses, and quite everything in between. And so now I’ll show you just how easy it is to come out here, view the sculpture, enjoy our Roaring Fork Valley many amenities, and take off upon the Wild Western adventure that you hadn’t realized you’ve been secretly yearning for all these years. Here we are then; may I present Shangri la… I mean… the Roaring Fork Valley ! Yes, difficult as it may be to imagine, out here in the wilds of the Rocky Mountains you’d be surprised at the volume and variety of ‘amenity’ presenting themselves within the tight little grid of these few short miles. Eight miles it is from Woody Creek to Aspen, and I cannot think of much in the way of service, entertainment, dining or dancing, renting or leasing… that cannot be found here. Skiing, boarding, snowmobiling, golf, fishing, biking, hiking, ballooning, kayaking, hunting, camping… its all here! As for accommodation, we have everything from super-deluxe five star resorts, private rentals and such, to your usual luxury hotel, your standard generic hotel, a handful of ‘affordable‘ motels, as well as a seemingly ever increasing number of Airbnbs. As Rocky Mountain valleys go, the Roaring Fork presents itself as a broad counterpart to the contrasting narrow ravines more commonly to be found in this corner of Colorado. Woody Creek has an open aspect about it that affords many a spectacular view of all four ski resorts: Aspen, Highlands, Buttermilk, and Snowmass. The “Upper Valley”, as it is known, is served (remarkably enough) by a totally free bus service… one that proves so popular with locals and tourists alike that they hop aboard the frequent low emission vehicles with scarcely a second’s thought. Quite something, eh? In fact, I’d go as far as to say that you really don’t need a car in order to see, and do, everything this extraordinary valley has to offer. 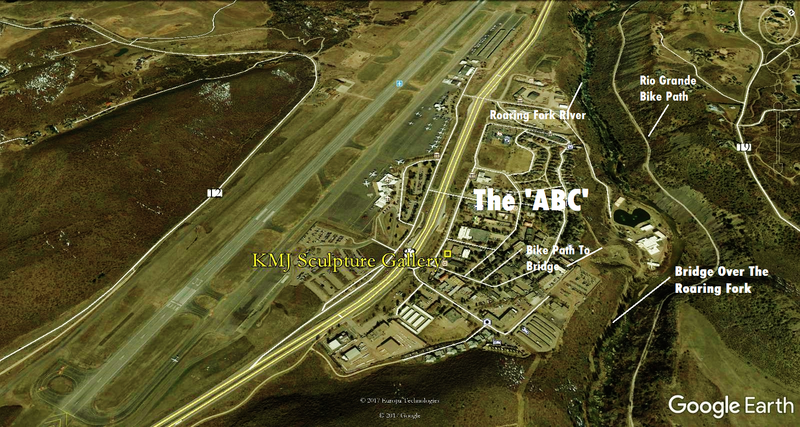 If you look outside your port side window a minute or two before touchdown I will stand outside the gallery and wave as your plane hones in on Sardy Field, Aspen’s compact commercial airport, or “Pitkin County Airport” as the authorities insist on calling it (although no one else seems to). 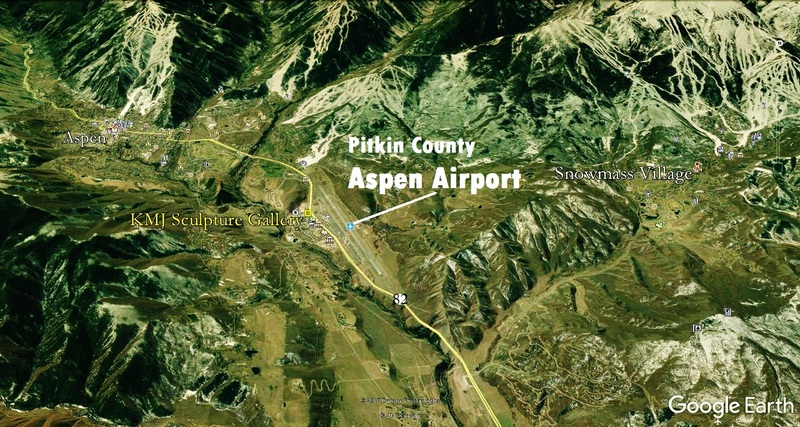 As the aircraft turns and makes its way to the terminal, you will have a moment to peek through the starboard window and catch your first glimpse of Aspen’s famous ski slopes – as the skiers/boarders/mountain bikers will be clearly visible to the naked eye. Yep! you’ve landed that close to town. Three miles separate you from downtown Aspen. A ten minute, five mile, journey north of the terminal will deliver you to my studio gallery. And ten minutes west will also get you to Snowmass, with its own wealth of hotels, restaurants, galleries and bars quiet in addition to the hundreds of such places in Aspen itself. 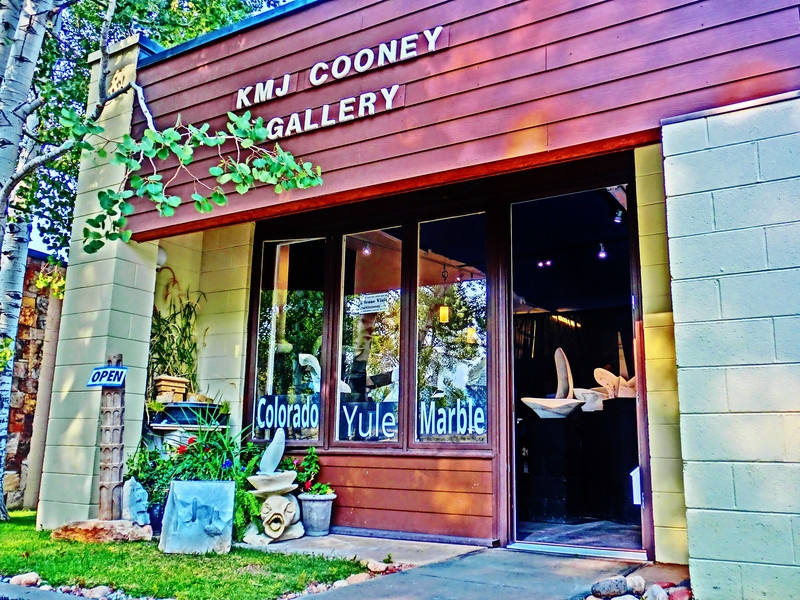 And so, what will you discover once you do arrive here in the Roaring Fork Valley? Here’s a little montage of photos, all taken in Shangri la… I mean, some place here in the Roaring Fork Valley; beginning with the above sunset views of the Birdhaven Studio Sculpture Garden. Not braggin’ just sayin’… we do have really great snow! And the even very ‘Continental Divide’ itself ! And so, what are you waiting for ? Now that you exactly where it is, and the brilliant time you would have in the process… all I can say is Man (or Woman) Up, and set too making definitive plans to Visit Birdhaven, my Studio Sculpture Gallery, here in Woody Creek, Colorado. Well? Come on, you know it’ll be fun. This entry was posted in All Postings, Posts about My Daily Life, Posts about my Sculpture, The South West American Way, Travel Posts and tagged Art, Artist, Aspen, automobile touring, Colorado, curvilinear, gallery, guide, independent tourist, Marble, Roaring Fork Valley, Sculpture, Stone Carving, Stone Sculpture, studio, tour guide, Travel, travelogue, Woody Creek, workshop, Yule marble. Bookmark the permalink.